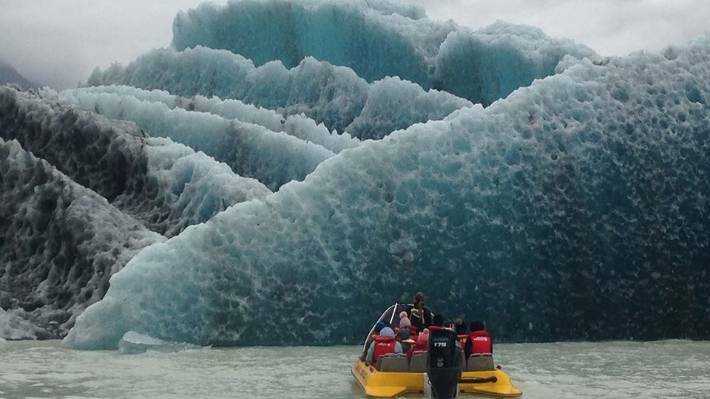 Photos have emerged of huge chunks of ice which have broken off the Tasman Glacier. The photos were posted to Facebook by two local guides who were alerted to the event in the Aoraki/Mount Cook National Park early on Wednesday morning. 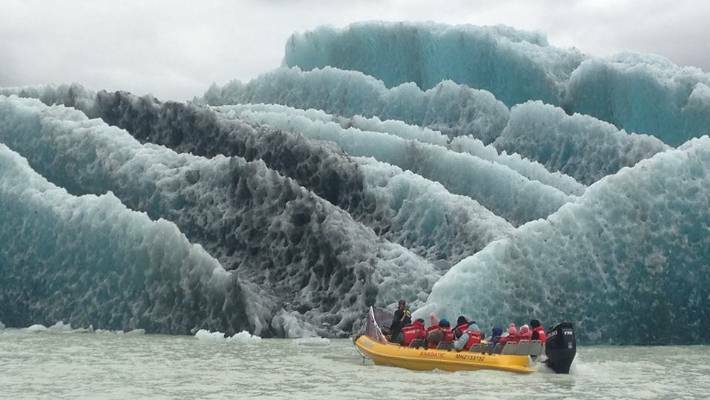 "Glacier Explorers called us about the event so we got there after they had cleaned up some of the chaos," Anthony Harris, a guide at Southern Alps Guiding, said. 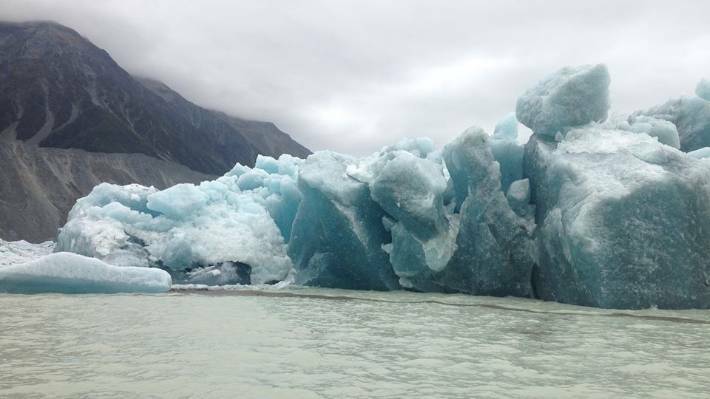 Large chunks of ice have come off the Tasman Glacier on the South Island's west coast. "Luckily the kayaks were racked and above the height of the waterline." A tidal surge up to 2 metres high smashed the jetty about and lifted a boat trailer upside down onto another trailer, Harris said. The process is known as glacial calving. "All in all, this is the most significant event I've seen in the last five years on the Tasman. "The present SE [southeasterly] is holding these bergs in the northern section of the lake and will do so for at least another day or two. "Once we get a NW [northwester] they will begin to fill the lake with bergs of all sizes ... some of these are really big." Glaciologist Heather Purdie says large calving events happen about once every two years at the Tasman Glacier. The breaking of ice chunks from the edge of glaciers is known as glacial calving. 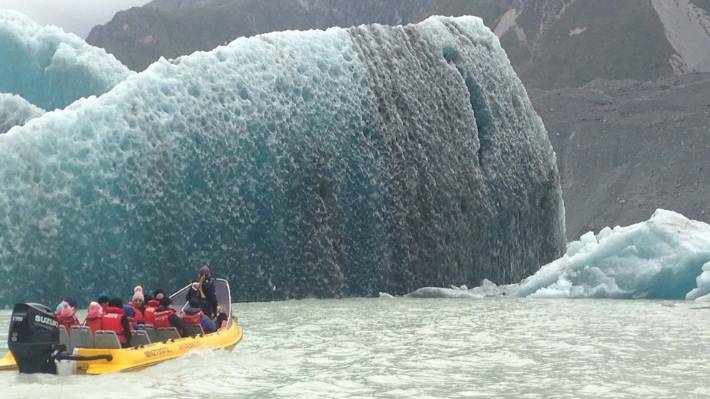 University of Canterbury glaciologist Heather Purdie said large calving events like this one happened about once every two years on the Tasman Glacier. They were caused by glacial ice above the water melting, putting pressure on the ice beneath it still under the water. The photos were taken by two guides who operate in the area. When the pressure became too much, the ice eventually snapped off. "The water gets in underneath the ice and sort of jacks it up, and it snaps off. "Large calving events are less frequent but the icebergs that come up are really big." The calving was caused by ice above the water melting, putting pressure on ice still under the water. 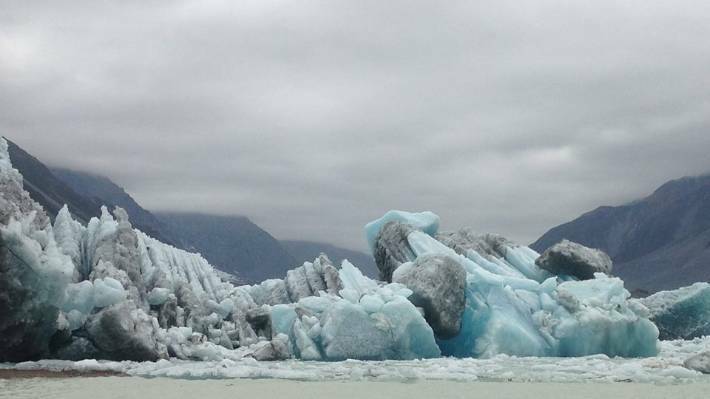 The calving was not necessarily the result of global warming, although the glacier retreating and becoming smaller was attributable to warming, Purdie said. "Not necessarily because of global warming". Yeah, right! The summer heatwave has massively affected New Zealand's glaciers, resulting in the largest annual ice loss on record. The meltback was observed by the annual Glacier Snowline Survey, a collaboration between NIWA and Victoria University. Survey founder Trevor Chinn said it was one of the largest glacier meltbacks since he began the survey in 1977. 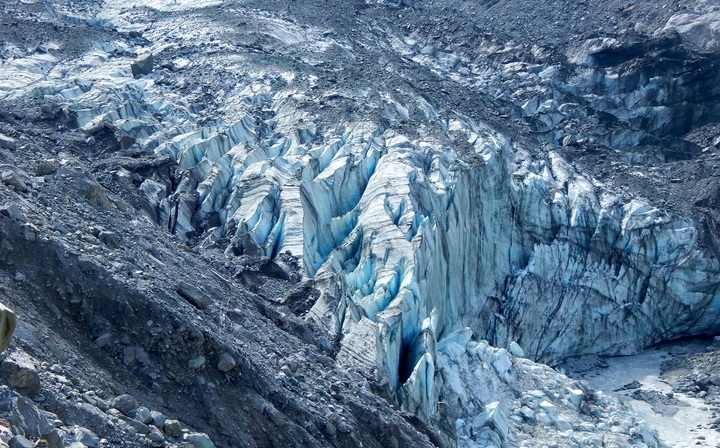 "A glacier is the best climate change indicator you can use," he said. New Zealand glaciers have lost 30 percent of their ice, in the 40 years that the annual snowline survey has been running. Whether these dramatic results could be directly attributed to climate change "is the $64,000 question", Niwa climate scientist Andrew Lorrey said. Niwa said it was embarking on formal testing in collaboration with Victoria University and the University of Melbourne to see if a definitive correlation could be found. "Can you actually get a natural event like this, or is it something where climate change has loaded the dice and it's pushed us over some sort of threshold?" Dr Lorrey said. "Those are the questions we're looking to answer."